A roman scutum, the XI stands for Legio XI, one of the legions that went on the quest to conquer Gaul, recruited by Julius Caesar. 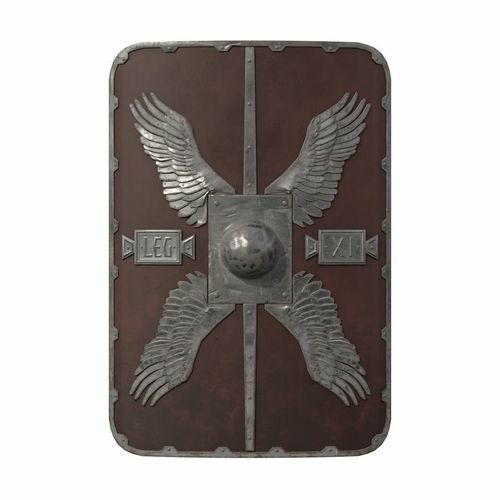 The design of the shield however is inspired on the movie ‘the Eagle’. The movie was about Legio IX, which existed around a 100 years later and was based in Britain. Modelling and Sculpting was done in Blender 2.79, baking and texturing was done with Substance Painter. The model uses a 4K PBR textureset (Basecolor/Albedo, Metallic, Roughness, Normals). Other resolution are available if needed. If you consider purchasing, but would like to see something altered, just send a message!